Sanskrit Names of Emerald Shukra-ratna, Vajra, Lightning bolt, Hiraka, Bhargava-priya, Beloved of Venus. Ketu Mantra "Aum Ken Ketave namah" to be enchanted 108 times at the time of wearing a Cats Eye - Lehsuniya. Signs of well-placed Ketu in the Chart Happiness, Good children and grandchildren, Wealth, name, fame, success and honor, wisdom, and longevity. Signs of an afflicted Ketu in the Chart Native will not be a moderate but an extremist. Over generous, extravagant, lavish. Over optimism, false hopes, carelessness, debts, disputes, failure in speculation, gambling, pressure from creditors, worry through children, childlessness. Vanity, default, infamy, gluttony and unusual growth. Cat's eye has concentrated infrared cosmic rays which are hot, it is used it cure chronic and terminating diseases. It cures cancer, skin diseases, smallpox, diabetes, breathlessness, diarrhoea and eye afflictions. Cat's Eye is the most valuable type of corundum (Aluminium oxide). It is a stone of Pinkish Red color and generally occurs in a crystal of six sided prism. 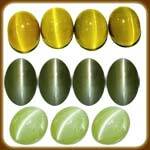 Cat's Eye is known for its hardness. If it is rubbed on a stone, the stone may show signs of friction but the Cat's Eye will not lose weight. All the Gemstones sold by Astrojyotishi.com are Certified for Quality by ISO 9001:2008 Gem Laboratory. All the gemstones are tested by experts to assure best quality, free from flaws or defects of any kind. We give 100% International Guarantee of the quality of our Gemstones. We personally purify the Gemstones by performing yajya with vedic mantras.